How does your lubricant compare? In 2015 the EPA estimated that the automotive industry was accountable for approximately 27% of the USA’s total greenhouse gas emissions. As awareness on climate change increases and resources deplete government legislations tighten pressuring manufacturers to find a way of reducing these emissions whilst keeping costs low. Optimizing the lubricants used such as engine oil, transmission fluids, axle lubricants and gears and bearings lubricants can reduce frictional losses by 10% subsequently improving efficiency by up to 2%, this plays an important role in decreasing these emissions. How can tribology research work towards achieving this reduction? 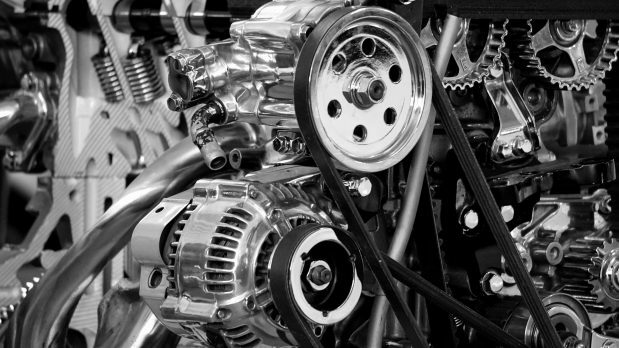 Lubricants are used within the engine to transport foreign particles, regulate the temperature of surfaces and most importantly to stop the moving parts from rubbing together. This reduces wear, improves efficiency and protects the system against early failure. The conditions an engine faces changes regularly from start-up on a cold winter morning (low temperatures, low speeds) to flat out running on a hot summer day (high temperature, high speeds) and everything in between. The lubricant needs to be able to perform efficiently under all of these conditions to be suitable for the application. Using a Mini- Traction Machine (MTM) the friction coefficient can be measured throughout the range of temperatures, speeds and slide-to-roll ratios found in an internal combustion engine, highlighting where efficiency could be improved. MTM test profiles like these are widely used by oil and additive companies and OEMS’s to benchmark their lubricants against market leading products and produce new innovative formulations and product design to meet everchanging objectives. Figure 1 shows the effect speed and temperature has on traction using a mineral oil. The viscosity of the lubricant under operating conditions determines how much energy is required to pump it through the system. The viscosity needs to be high enough to separate the two moving parts but low enough to not waste additional energy circulating the lubricant. When the engine is moving at high speeds the lubricant film is thick, fully separating the two parts this is circled in red on Figure 1. At these conditions the viscosity is the main factor which determines the friction coefficient. When the speed is low and temperature high the lubricant film is very thin, circled in green, this inevitably leads to asperity contact which increases the friction and reduces the efficiency of the system. Commercially available lubricants are made up of a confidential blend of base oil (90%) and additives (10%) including friction modifiers, viscosity improvers and antiwear additives all which play an important role in optimising the system at every speed, temperature and slide to roll ratio. Viscosity Improvers: help stabilise the viscosity across all operating temperatures and speeds. Friction Modifiers: reduces the surface friction of the lubricant. Antiwear Additives: are activated by asperity contact and form a protective layer on the surfaces to stop the two parts rubbing together. 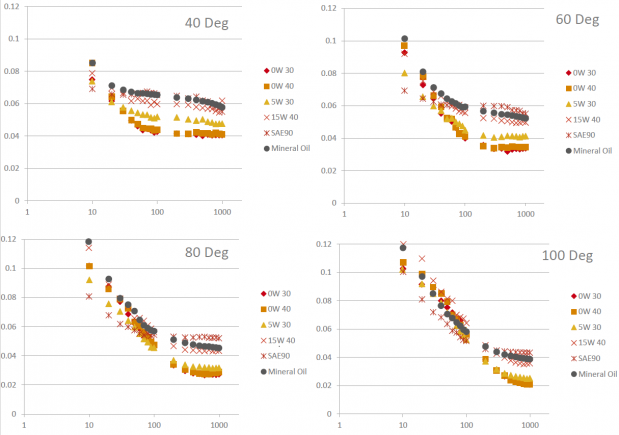 A range of commercially available engine oils, 0W30, 0W40,5W40 and 15W40 and one gear oil (SAE90) which have an increasing viscosity respectively were tested to see the friction at every temperature and speed, the results are displayed in Figure 2. 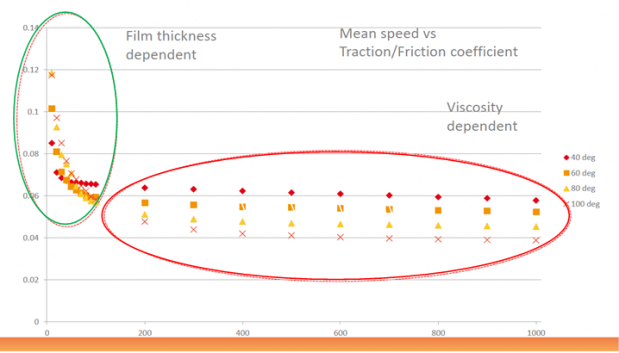 From Figure 2 you can see how the lower viscosity oils perform better at higher speeds. At lower speeds the antiwear additives have been activated and reduce the friction to below that of the mineral oil (which doesn’t include any additives). Formulators are continuously striving to achieve reduced friction whilst remaining competitive. MTM test profiles like these are widely used by oil and additive companies and OEMS’s to benchmark their lubricants against market leading products and produce new innovative formulations and product design to meet everchanging objectives. 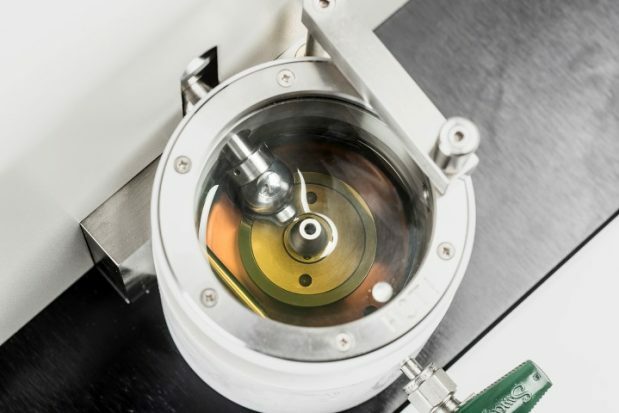 PCS are leaders in tribology test equipment supplying bench top instruments to experts researching frictional properties of oils and additives for a wide range of industries from automotive, and aerospace to wind turbines and industrial applications. For published papers in these fields visit our knowledge section. Alternatively for more information please contact us.